Picture: the Honorable Fionnuala Quinlan, Consul General of Ireland in Boston, Governor Brennan and his wife Connie Brennan. Former Commissioners, gubernatorial and congressional staffers, family, friends and colleagues of Governor Joseph E Brennan were among the 250 guests who gathered to celebrate the Governor’s more than 5 decades of public service and to dedicate the Governor Joseph E. Brennan Archives at the Maine Irish Heritage Center located in the former St. Dominic’s Church on State Street in Portland. Senator George Mitchell served as Honorary Host and gave the keynote address. are beginning to be donated and are on display at the Archives. 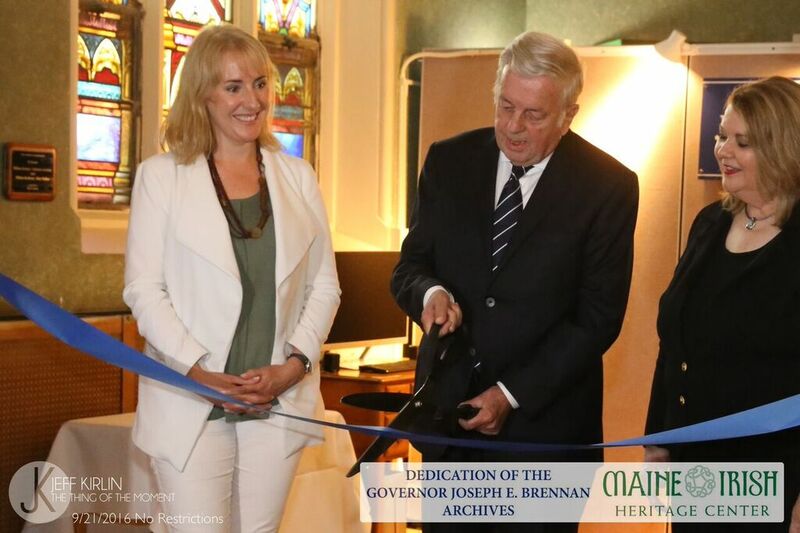 The Archives are now open by appointment by calling the Maine Irish Heritage Center at 780-0118. Soon we hope to be staffed to open to the public also on Fridays from 1-3pm.